Unleash the party animals! 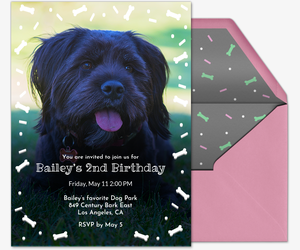 Whether you have pets or just love ‘em, you’ll adore the furry friends in our brand new collection of pet invitations, featuring dogs, cats, bunnies, birds, and more. 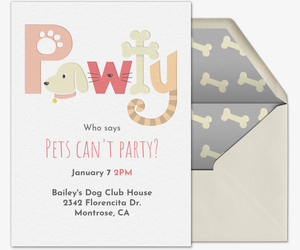 Throw a dog party or a cat party for your pet’s birthday or other milestone (Bark mitzvah or yappy hour, anyone? 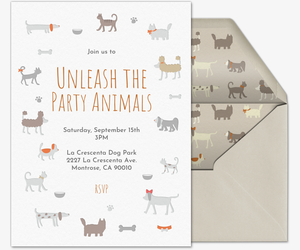 ), host an animal-themed party for people, or just use an adorable pet invitation for whatever occasion you’re celebrating. 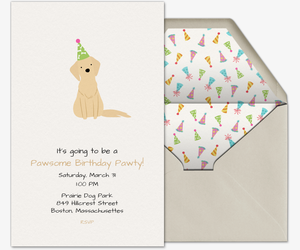 Or, browse our animal-themed birthday cards, sympathy cards, or other greeting cards in our pet cards gallery. 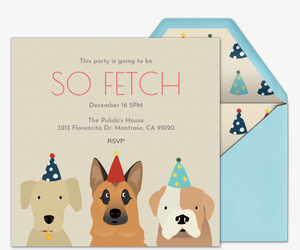 Paperless invitations make personalization easy. Include a custom host message on your digital invitation, then track RSVPs, manage your guest list, and send messages and share photos with guests throughout your event. Don’t sweat searching through your contacts for email addresses -- just send your online invitation's shareable link via text or posting on social media to spread the word about your event. 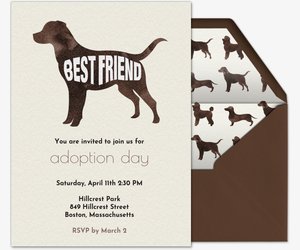 Treat your four-legged friend to something extra-special by using one of our ad-free Premium invitations. 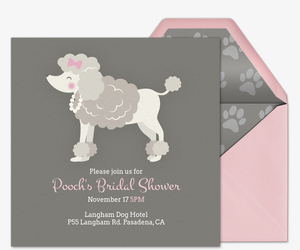 Packaged with a matching envelope and customizable stamps, Premium invitations offer the same look and feel as printed, paper invitations, and are priced based on the size of your guest list. Check out our new collection of cards for pets and pet lovers, too. Whether you’re sending a card to yourself from Fido, or just sending an adorable design to a friend who’s obsessed with fluffballs, our gallery features cards for all types of occasions and animals. 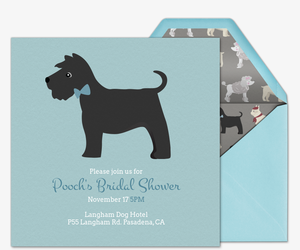 You can use our animal invitations whether the pets are invited or not. Plan a birthday party, beach party, pool party, summer outing, wedding, dinner party, casual get-together, and more -- all with Evite.